Image: Members of LHCb UK explain reseacrh on antimatter to exhibition visitors. Scientists from LHCb UK are presenting their research into the nature of antimatter at this year’s Royal Society Summer Exhibition. They invited members of the ATHENA collaboration and people working on PEPT devices to also collaborate in the exhibition. Why we live in a universe made of matter, rather than a universe with no matter at all, is one of science’s biggest questions. The behaviour of antimatter, a rare oppositely charged counterpart to normal matter, is thought to be key to understanding why. However, the nature of antimatter is a mystery. Scientists use data from the LHCb and ALPHA experiments at CERN to study antiparticles and antiatoms in order to learn more about it. Some of these scientists will present their work at the Royal Society’s annual Summer Science Exhibition which opened to the public on 5th July 2016. At CERN’s Large Hadron Collider particle accelerator, matter and antimatter versions of fundamental particles are produced when the accelerator beams smash into each other. The LHCb experiment records the traces these particles leave behind as they fly outwards from the beam collisions with exquisite precision, enabling scientists to identify the particles and deduce whether they are matter or antimatter. At larger scales, antimatter is studied in CERN’s antiproton decelerator complex, when antiprotons are joined with antielectrons to form anti-hydrogen atoms. The ALPHA experiment holds these antiatoms in suspension so that their structure and behavior can be studied. Both experiments are currently recording data that will enable scientists to carefully build up an understanding of why antimatter appears to behave the way it does. 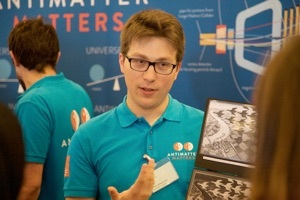 Visitors to the Exhibition will also be able to see how fundamental particles and antiparticles are identified with the LHCb experiment, talk to researchers to discover what this science is like, try the experimental techniques used to hold and study anti-atoms with the ALPHA experiment, and move, image and locate antimatter within a PET scanner system. The organisation of the exhibition was the centrepiece of the Pathways to Impact Outreach Proposal for application to STFC for support for the LHCb Upgrade experiment. Many materials have been developed for the exhibition including hands-on exhibits, a stand, a brochure, a website, online event dispalys and the opportunity to analyse LHC data yourself.